Over the last few months I have been working on an exciting project which combines many of my creative skills. 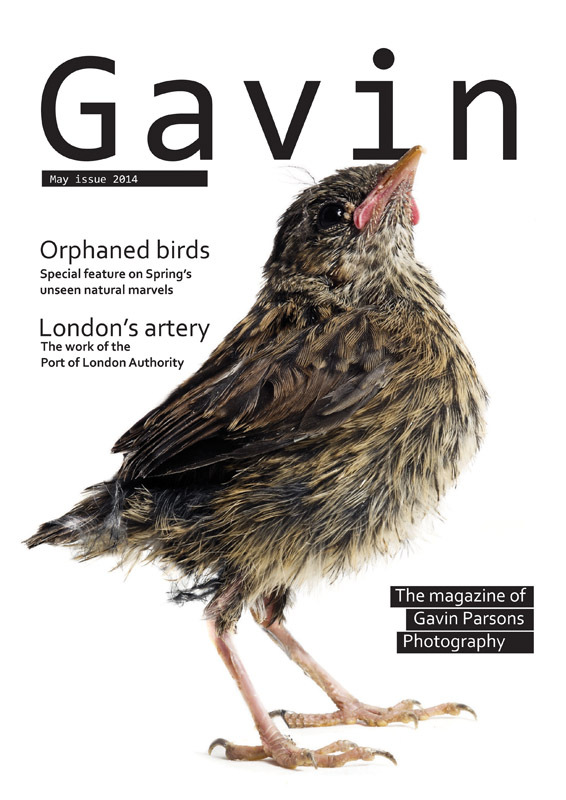 And this weekend just gone I released Gavin magazine. Gavin is a showcase for my photographic, written, and design work and has been published online on the issuu platform. There is a link to the magazine at the bottom of this blog post. I have opted for a soft launch rather than a grand fanfare as I am just finding my feet with online publishing. I have been involved in the publishing of hundreds of magazines over the years, but this is the first time I have used an online platform such as issuu, so I wanted the first issue to be stunning, yet reserved. More issues will follow and they will include both personal projects that I have worked on in recent years and commercial work I am able to publish. Some of my work I am not allowed to use for certain reasons, which I always respect. As always when creating a magazine I used Adobe’s Indesign and worked hard on choosing complimentary fonts, I hope you like what I’ve chosen. I decided many of the images needed to have the background story, which is so difficult to do on a portfolio website, which is another reason for working on the magazine. So some of the images have a caption, but others are part of a much larger story. This is fairly limited in the first issue, but the articles will increase as the magazine grows in popularity. Since my first job, I have always been involved in photography and magazine creation, so this is a logical step for me. I have the writing, design and photography skills needed, but the process has been a learning curve. At the moment the magazine is just online, but I am looking at offering a hard copy (although this will be a paid for service as buying any magazine) and as the readership grows I will possibly offer advertising opportunities for business looking to advertise their services and wares alongside my editorial (The adverts in the first issue were donated to companies who have helped me obtain images or offered advice). I hope you enjoy reading it and please let me know what you think and also if you have any questions, comments or requests for areas of my work you’d like to see included in the magazine let me know. It’s up to every business to make their people look good. I don’t mean dress them smartly, give them clean uniforms and wash their work’s vehicles every once in a while (although that will help), I’m talking about in their promotion and publicity. Models wearing your company logo is one thing, but people can spot a model a mile away these days. How many chiselled 6footers with manicured hair and nails do you find on a construction site or hanging off the side of a muddy wall? What’s needed is real life. Your real employees, the people who know how to do the job and how to make it look professional. And if your employees look and act professional, then you can use them to promote your business. Photographing real people in real situations has become a specialty of mine over the last few years. Several of my clients need promotional material for press releases, social media and advertising, but sometimes budgets won’t stretch to models and sometimes they just want the people doing the job. They did though, want stunning looking shots. And this is the key to getting eye catching images as opposed to snaps. Any of my clients could have sent a foreman or manager out with a camera or even a phone and grabbed a couple of pictures, but they realised to get the job done right, they needed a professional commercial photographer to not only get a distinctive and engaging image, but also to process that image correctly and imaginatively to really make their photography pop. 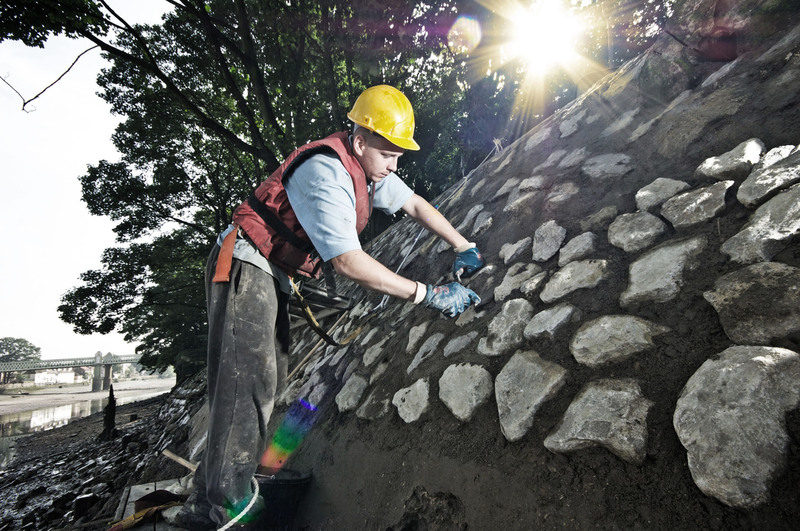 The example attached to this blog is a workman repairing a stone wall on an island in the Thames. It was dirty, hard work and the people doing it were skilled at the task. Plus they were used to the river environment and the hardships that spending days on a small island completely detached from London life brings. A model could never portray that. So I worked with the builder as he was doing his job. I spent the best part of a morning in pretty good light working in the Thames mud. It wasn’t a job for a model photographer, or indeed a news photojournalist. It was a job though that I love. I’ve photographed the transformation of the island over the years for the same client. I’ve been attacked by Canada Geese, photographed tree surgeons measuring the trees, arbours sculpting the trees and then the guys repairing the walls. I’ve photographed in sun, rain, cold and heat and every time I bought back images that impressed the client. That’s why getting a professional to take the pictures you use to promote your business is a key part of marketing. Viewers looking for businesses to hire, will always stop and look longer at a website with unique and characterful imagery, than they will on a website full of royalty free generic snaps. look for a professional photographer who can help you achieve that goal. The French Newspaper Libération’s 14 November issue ran without pictures. Instead of harrowing images of the typhoon ravaged landscape of the Philippines or war torn Syria or even pretty pictures of baby animals doing cute things, there were empty white boxes. The story can be seen on the BJP-online site at http://tiny.cc/jh8k6w. I think it demonstrates firstly the power pictures play in the news telling process, but more importantly, what our French cousins think about photographers. Would the British media industry do such a thing? I very much doubt it. They seem more concerned about drumming photographers out of business as they chase cheaper and cheaper rates. The UK media has pinned content (words and pictures) to advertising revenues. When the ad revenues fall, so do the rates they pay for content. A shrewd business plan you would think, except it fails one critical point. If you pay peanuts for content you will drive the creativity and heart out of the contributors and before long you end up with bland camerphone style images which then drives away your customers.The UK media industry needs to acknowledge, the readers are the customers as well as the advertisers. Why hold your readers in such low regard? It’s a point that has always baffled me. The BJP (British Journal of Photography) actually made a bold move a few years ago and instead of racing to the bottom as many others did, it took about three steps up and is a much better and more respected publication because of it. With a market flooded with photography, you’d think the British magazine and newspaper sectors could command global respect, but very few do. The reason is they care little for the content and more about the Ad revenues. It’s a decision I believe will leave them behind the curve. The electronics sector which creates new technology is deciding the direction the media industry has to go on a global scale. Pro cameras these days do both still and video, many people carry tablet readers and it will not be too long before many of the world’s great cities will offer wireless access everywhere, so you can sit in the park and read your favourite newspaper or magazine online live. You’ll be able to see a stunning high definition picture on screen and be able to tap it and watch a video clip to enhance the story. This is the way technology is pushing us, whether we like it or not. Will the UK media industry be able to keep up? I have to say I doubt it in many cases. They simply do not pay enough for contributors to keep up with the latest technology. In many cases it falls to hobbyists with well paying corporate jobs and an desire to see their work published no matter what the cost. The UK media industry will price the most creative and talented people out of the market and then wonder why no one is reading their produce. I think this is a crying shame, but one that is inevitable I feel. I wonder how many publishers will take note of what Libération did and think about the future rather than firefight today?